1) Why don’t the Bears have regular names like Bob or Betty or Sally – why just Mama, Papa, and so on? I could answer that the bear family is a family of symbolic Everybears – ursine stand-ins for the typical American family. But the real reason is that when the characters were created in 1962, it was for the limited vocabulary Beginner Book line and it was felt that Mama and Papa would be easy to read. 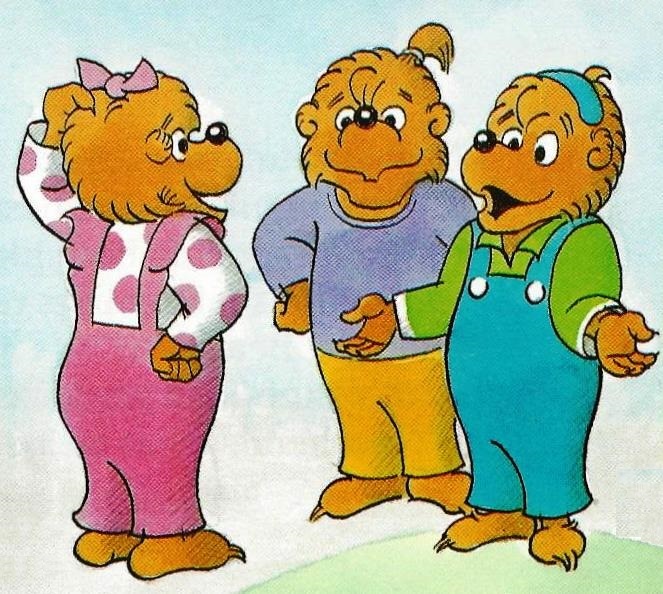 2) Why do the Berenstain Bears always wear the same clothes? They are bears, not people, and bears always wear the same clothes. Just go to the zoo sometime to check this out. 3) How long does it take you to do a book? This question tends to come from kids who are considering creating children’s books as a career and are concerned that it may take up too much of their spare time. The answer is … as long as it takes. 4) How do you draw the same picture over and over again in all those books so many times? This comes from children who are under the impression that we draw all the printed copies of our books by hand. They have never seen the huge commercial printing presses on which children’s books are printed. I usually tell the children who ask this that we just Xerox them. 5) Why did you decide on using a bear family as the central characters in your books? There is a tradition of bears in children’s books and, also, they are animals that naturally stand up. They look good in clothes and seem almost human when the humorous illustrator works with their facial expressions. 6) Why don’t you do some books about some characters besides the Bears? It’s a good question. We certainly do seem to have gotten stuck in a rut! 7) One question came from a particularly observant youth who pointed out that in The Berenstain Bears and the New Baby, it says Papa Bear hollowed out the family’s tree house from an oak tree. 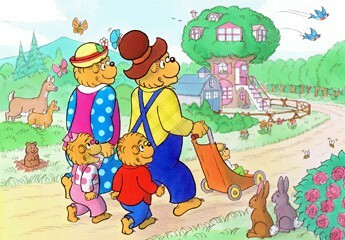 But in The Berenstain Bears’ Moving Day, the family purchases and moves into an already existent tree house. We gave this one to my mother, Jan. Her answer was, I thought, resourceful. She explained that the Bears did, indeed, move into the tree house as shown in Moving Day, but Papa then expanded it by carving out sections of the trunk previously unoccupied. You can see why my mother was the brains of the operation.